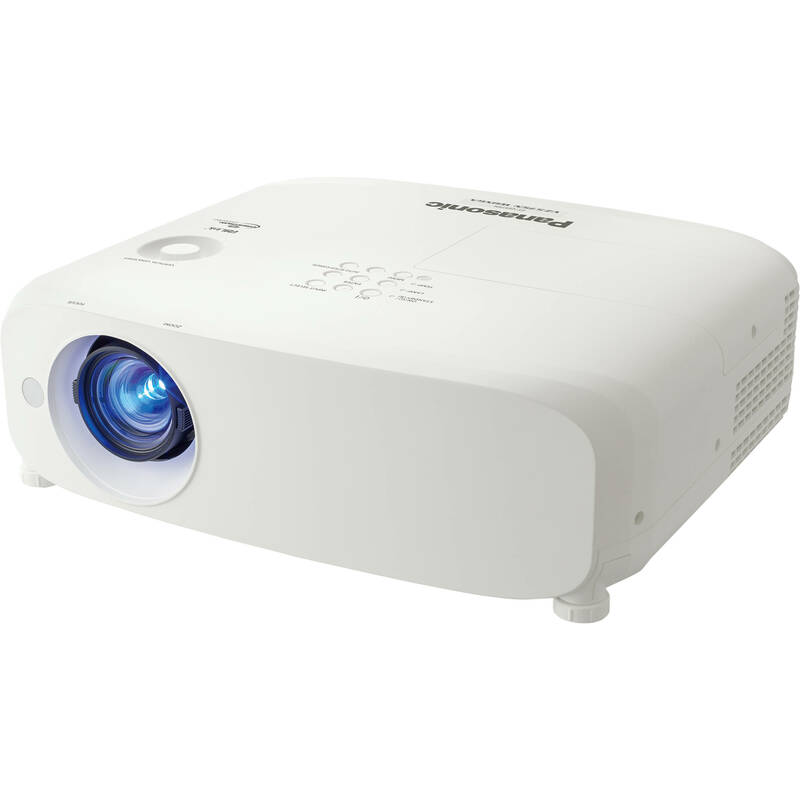 Enjoy bright images in many everyday settings with the Panasonic PT-VZ470U 4400-Lumen WUXGA 3LCD Projector. Its 4400 lumens of brightness and 10,000:1 dynamic contrast ratio will work together to overcome light in relatively bright rooms and provide detail in dark areas of the image. It sports a 1920 x 1200 WUXGA native resolution for viewing HD video and detailed pictures or data. The projector's 1.1 to 1.8:1 throw ratio and 1.6x manual zoom provide a range of throw distances for focused images. The PT-VZ470U features RCA composite video, two HDMI, and two VGA inputs to connect to nearly any device. Its analog audio input and output will allow you to pass sound through the projector to your sound system of choice, and one VGA input can act instead as an output to daisy-chain multiple projectors or displays together. The projector is controllable via the included remote control, Ethernet, or RS-232 with various control software options. The PT-VZ470U portable LCD projector features WUXGA (1920 x 1200) resolution to bring Full HD video to big screens in small spaces. It is designed to produce images that are sharp, smooth, and loaded with detail for an immersive viewing experience. The PT-VZ470U outputs up to 4400 lumens. High brightness brings colors to life, enhancing realism in presentations in well-lit rooms. The PT-VZ470U produces only 29 dB of fan noise in Eco Mode. The 10,000:1 dynamic contrast ratio helps produce deep blacks, pure highlights, and crisp, easy-to-read text and graphics. Daylight View Basic helps prevent the picture from washing out in bright rooms by sensing ambient light levels and adjusting the picture accordingly. Halftone color and brightness are automatically optimized to make images sharper and brighter in nearly any environment. The PT-VZ470U extends lamp and filter operational life to 7000 hours in Eco mode. When maintenance is eventually due, you can replace both the lamp and filter at the same time when used in Eco mode, even with the projector mounted on the ceiling. The PT-VZ470U features a vertical lens shift function that allows you to move the image up or down without distorting the picture. This is useful for quick image corrections in portable applications. Horizontal, vertical, and corner keystone correction adjusts the image shape for clear visibility when projecting off-axis or from an unusual angle. Should the vertical projection angle be altered during operation, real-time keystone correction senses the change and makes any necessary corrections for optimal viewing. Curved screen correction is designed to allow you to project natural, distortion-free images onto curved or cylindrical surfaces, such as sculpted corporate reception walls, large pillars, etc. The PT-VZ470U plugs into existing projection networks controlled by Crestron Connected, PJLink Class 1, and AMX software. Multi-Projector and Monitoring Software enables control of multiple projectors from a computer. The PT-VZ470U projector can be positioned almost anywhere with a variety of projection distances, made possible by the 1.6x zoom lens function. It enables projection distances of between 7.7 and 12.5' from a 100"-wide screen for large-format pictures in small, medium, or large rooms. Whether you're planning to install your projector on the ceiling or take it with you to a meeting, a selection of input terminals is included to connect a variety of source devices, including two HDMI terminals and two VGA ports for a computer. Box Dimensions (LxWxH) 23.5 x 17.5 x 17.5"
PT-VZ470U 4400-Lumen WUXGA 3LCD Projector is rated 5.0 out of 5 by 1.